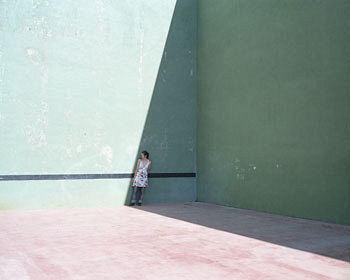 * Paola Ferrario is a Rhode Island based photographer and teacher with quite a pedigree of awards (Taylor-Lange grant, Guggenheim fellowship in photography) and degrees (MFA in Photography from Yale), but what's most impressive about her website and various projects is how understatedly and quietly poetic her work is. All her projects -- from the dreamy, triptych based Traveler and Inheritance, to the more ostensibly "straight" yet still moody "Royal Mills" and "Texas Cotton Towns" -- are quiet and modest, but pack a punch that many contemporary photojournalists and conceptual photographers struggle to achieve. "We live in an age of paradox, where we romanticize ethnicity but at the same time we work to convert the world into a global village. We are dependent on new technology, and yet we strive to preserve ancient time consuming crafts. I felt the best description of our time could come only if I allowed for a virtual world made of fragments and indefinable geographic locations…for the Traveler series, although retaining a concern for historical accuracy, I have given myself more liberty in order to emphasize my role as the lyrical observer and visual poet." * Eustaquio Neves is a Brazilian photographer with a very interesting portfolio of alternative-process based collages that (obliquely) speak to colonialism and to the history of African slaves in Brazil, and (in another portfolio), the mythic role of football in Brazil is explored. Like Fereiro, Neves doesn't hit the viewer over the head with his explorations of some heavy themes...he chooses to meditate on these themes by using symbolism and layers in his photographs. * Finally, Gerard Lange is a very recent MFA photography degree recipient based in New Orleans who has a substantial body of work (mostly pinhole images) centered around memory. His website has the most comprehensive collection of his work, but it seems to be undergoing some renovation, as over half the portfolios seem to be down. 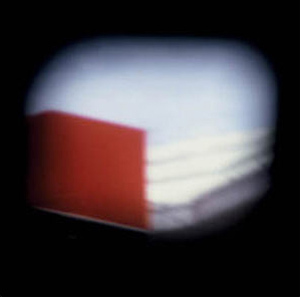 My favorite portfolio, though, is up at his site and at the Meter gallery: Les Etudes, minimalist color pinhole images that provide hints of the everyday, but with enough distance to leave me with a feeling of disquiet...the spare details and washes of color are sprinkled expertly throughout the portfolio. The tools of soft focus, vignetting and pinhole have been done so much that (as I've said before in this blog) they've become, in the wrong hands, mannerisms every bit as affected and trite as the commercial photographs they supposedly provide an alternative to. I personally find I have an increasingly limited appetite for the toy camera/lomo/pinhole aesthetic as more of it floods out there...it's like gorging on the greasy, overflavored buffets that cheaper ethnic restaurants offer at lunch...quick satisfaction, and it's better than McDonald's, but do it a few times and it's just as forgettable. Lange escapes this trap with his best work...the most minimalist of his images are impressionist in the best possible sense of the word...abstractions that flirt with prettiness but use details and hints of the contemporary to provide some weight. 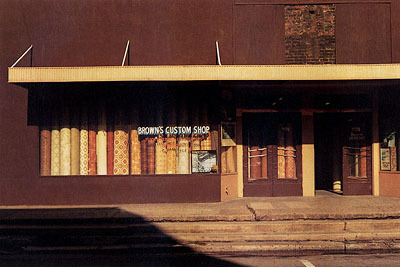 This deserves its own post: William Eggleston's website has just launched. Thanks to Christian Patterson of the Eggleston Trust for clueing me in, and this certainly goes to the head of the links in my recent collection of links on Eggleston posted earlier this month. In fact, this is like Christmas in August -- high quality images on the web (finally!) with reasonable color fidelity, from published monographs and never before seen portfolios, plus news of upcoming releases of photographic and video work, and loads of interesting articles. 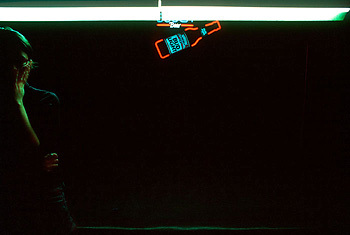 "[Eggleston] produces and shows me a large briefcase filled with about 20 cameras, most of them Leicas. They are uniformly lined up in the case like stacks of money in a spy movie. He has, in fact, been out in the morning fog shooting with a Leica – a “few sticks in the ground” he says with a quiet chuckle, and some bleach bottles at a grocery store “somewhere over there”, he says, motioning in the direction of Summer Avenue. He hasn’t noticed the thick fog at all, but thinks the bleach bottles and the sticks are going to make wonderful photographs." Kudos to the Eggleston Trust for putting together a resource this good (and that will no doubt get better as it evolves)...if only other major photographers could be represented similarly online this way. Be sure to wander around the website and look at all the images from various monographs, portfolios and publications, and be prepared to kill some time. * Say It Isn't So: Ilford goes into receivership, and faces closure. For many of the digital shooters, this will hardly register, but Ilford makes black and white films and papers that are standards in the industry -- at my photography school, the film they have everyone start with is Ilford's HP5, and the fiber and RC papers are standards as well. I can't even imagine doing photography in the future without some access to Ilford standards like HP5, Delta 400, and Delta 3200. Hope a buyer comes along, or the situation stabilizes so that the products remain available the way Polaroid products do (despite the equally sorry state of that company). UPDATE: Yet another article from the Financial Times here. * I first saw Michael Garlington's portraits in Black and White Magazine over a year ago, and found them intriguing. (More images: 1, 2, 3, 4, 5, 6, 7). I really like his original way with a portrait, and some of the more surrealistic stuff (almost all in black and white, though here's a color image). Not a lot of information about him that I could dig up, other than this cryptic blurb. * Quirky, unsettling portraits of a more digital nature, from Andrzej Dragan, also known as Czarny Kwadrat. Almost the obverse of Garlington, where smooth, muted color (or tinting) and a more peculiar sense of gravity from the subjects implicit in their faces (rather than Garlington's grungy B&W and his peculiar sense of absurdity) anchor the images and make them resonate. His website is very good, but I actually prefer to view his images all on one page in a portfolio, like in his photo.net gallery or his feature on webesteem. Viewing the individual images in very large sizes, one by one on his website, tends to play up the digital manipulation a little too heavily for me, though some may eat it up. Details of his manipulation techniques can be found here. * Ansen Seale, whose chronoscope photographs I mentioned on this blog back in April, has new work of dancers now up on his website. Very worth a visit, especially if you haven't seen his work before . The summer tends to be slow when it comes to releases of photography books and magazines, but it's been a good month with the latest issues of two of the best online photo magazines, ak47.tv and blueeyes (mentioned in the last post). The new issue of ak47.tv features, among its highlights, The Emerging Self, colorful and sensitive portraits of young teens and children growing into teenhood from Michelle Sank, Misty Keasler's quietly positive series (given the subject matter) Orphanage, and Xavier Ribas' Perfect Distraction, an exploration of life and leisure on the periphery of urban industrial spaces. 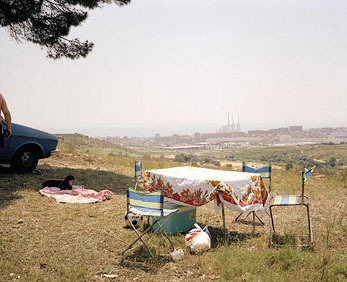 "...when I’ve visited such cathedrals of organized leisure as Isla Fantasia, Port Aventura or Montigalà, I’ve found more tranquillity in the adjacent patches of wasteland converted into improvised sunday dining rooms, than in the park interior itself. It strikes me that behind this improvisation there lies more design than accident. It is possible, then, that the interest in these spaces is due more to people coming to see the periphery as a place of freedom. Or put another way, that freedom can only arise in a residual space, and therefore presents us with an image of desolation." * Further examinations of life on the periphery, courtesy of Swiss photographer Loan Nguyen, whose lyrically mimimalist series "Mobile" (more images from series here, slightly larger images here) follows a lone woman through various desolate environments, with other symbols and images cryptically sprinkled in. Her commercial fashion work mines many of the same themes and moods. "Matthias Koch was a student of Bernd Becher at the Art academy of Düsseldorf. He takes pictures with a fireman's truck for which he had to pass a special driver's licence. The camera, format 8 x 10'', is placed at the top of the fireman's ladder, while the photographer, sitting in the driver's seat, takes the pictures with a teleguided apparatus. 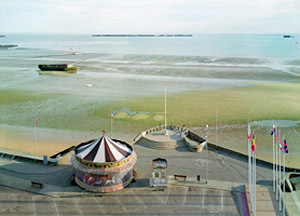 He hence creates a sensational connection between the architecture and the environment of the landing beaches in Normandy". This description provides some insight into why I find some of Koch's industrial tableaux compelling despite their matter of factness -- the slight aerial view provides a different view of details and a more interestingly detached perspective than a ground level photograph (which would provide a plainer, more common view of the details). At the same time, the perspective isn't so high that these would take on the appearance of surveillance photographs (though I can only speculate regarding the effectiveness of the actual C-prints since I'm judging from web images). More images from Koch here (still smallish, but better looking), and a wider variety from Diergarten here. * For those who find the Becher school of typologizing the photographic equivalent of watching paint dry, you'll know to stay away from the above photographers...but if you can't get enough, then Switzerland-based Joel Tettamanti gives you more...nice selection here, and much, much, much more on his website. Some of his night images look really good, but I find the typologizing of squash courts to be a bit much (even though it may simply be a sly joke, as the only thing distinguishing the courts is their corporate logos). * Forgot to mention before I left for vacation that there's a new issue of blueeyes magazine...this issue features Brian Ulrich (who I've recommended before) and Tim Carpenter's photoessay There There, which features industrial landscapes from Illinois and New York. Tim's eye for the curious color and emptiness of such landscapes is very nice...if you like it, there's more to be had on his website, Untitled and Unsung. While you're at it, make sure you check out blueeyes editor John Loomis' portfolio -- lots of good stuff, with the same attention to simple intuitive navigation, high quality online presentation, and color and detail that he puts into blueeyes. I especially liked the portraits, the personal folder, and the photoessay "Life After Grammie". 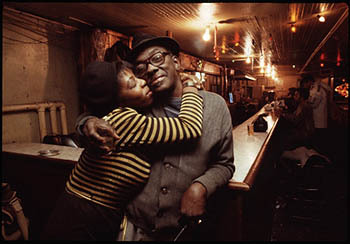 Lee Crum image, from "Easy Street"
* Crum's portraits evoke the mood of one of my favorite photo book pickups this summer, Birney Imes' Juke Joint, a reissue of a cult favorite from the early 1990s. 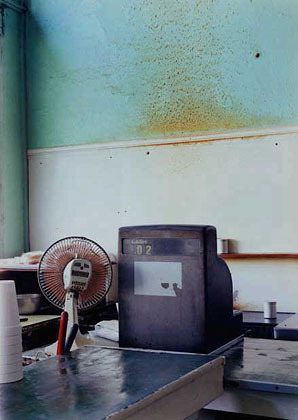 Imes uses a 4x5 and color negative film to get exacting detail and delicious color and atmosphere from the ramschackle interiors of many of the clubs of the Deep South. Some of the web images look quite nice, and should be checked out here, but the book images are especially great at bringing the viewer to a different place...this despite the fact that there's no lack of atmospheric decay in photographs out there (as anyone who's checked out this blog or others clearly knows). 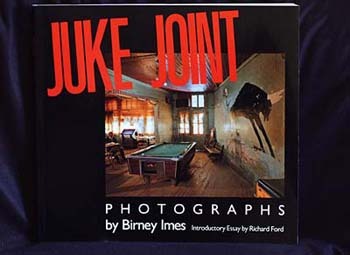 There's a nice article about Imes here, a review of an Imes exhibition here, and a Juke Joint book review here. "Something feels hidden in these brightly-wondrous photos, but nothing is. Ghosts whose presence we can explain make us feel some important secret lies in reality, and that if we would only look longer and more judiciously we would find out more about it. But when is that ever not so? Nothing tells us we've been mistaken about the world here; the familiar is simply braced by a fabric-feeling of the new. And conceivably we look with urgent interest because we sense we might just as easily be indifferent. And by that appeal -- an appeal familiar enough to any art -- excellence and value are given an occasion. 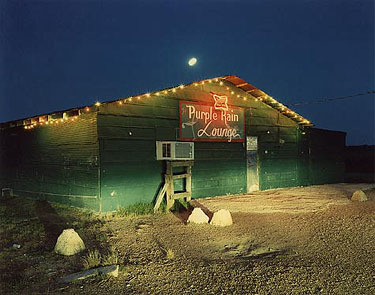 Birney Imes has noted that many of these buildings are gone now, moved out by time or by someone's timely idea, so that his photographs have become their only records. One day -- in not so long a time, maybe -- they may all seem to us as they seemed to Imes' friend, as unearthly things, as pure gestures of the photographer's imagination." Sometimes, it's hard to believe that the deadpan, off-kilter look of a good deal of contemporary commercial photography can be traced all the way back to the work of photography giants like William Eggleston, Stephen Shore, Nan Goldin, and a whole range of postmodern photographers emerging in the 1980s and 90s, not to mention the highly influential Dusseldorf school of photographers like Thomas Ruff and Candida Hofer. It's not hard to see how such pioneering photographers could have provided inspiration, but it's amazing (and depressing at times) to see how the deadpan can seem simply calculated (and yes, dead) when used in a rote manner and slickened up for commercial clients. These thoughts came to me when first browsing through the stable of photographers represented by the agency Special Bookings, but a closer look at the photographers (who all have excellent personal webpages) indicates they're a good cut above the norm (at least to me...mileage always varies, but especially so when dealing with the subtle commercialization of such nuanced and deceptively casual styles of photography). * I'm especially taken with German advertising photographer Julia Fullerton-Batten, whose work, even at its most commercial, has an eye for detail, and a sense of color and compositional nuance that rarely feels calculated and is often very striking. More images from Fullerton-Batten and a short description of her work can be found here, and yet more images here. * Christoph Morlinghaus' large format architectural images more overtly reflect the influence of the Dusseldorf school, though as some reviewers have pointed out, the point of view he takes often brings the viewer into the environment just a bit more, resulting in slightly more engagement and more tension. It's harder to appreciate this kind of work online (scale and detail are lacking), but Morlinghaus' web portfolio does well given the circumstances. Morlinghaus had a well-received exhibition at Brooklyn's Roebling Hall earlier this year, and a good overview of his approach can be found in this NY Arts review. * Jason Wilde's more documentary-styled portraiture is also worth seeing, but mainly on his own website, where the work is organized into more logical projects. (The Somers Town and St. Mary projects were the ones I enjoyed the most on his website). The agency portfolio gathers a selection of his work in such a way that the deadpan does seem more pro forma than it's actually meant to be. 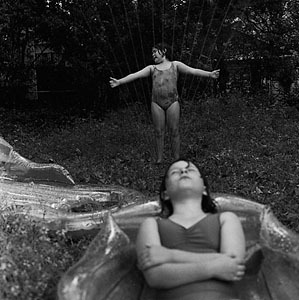 * For those who still think these folks might be too slick, check out Jocelyn Lee, whose approach to portraiture and documentary is direct, unadorned, and unpretty...even the images of children and young parents are very unsettling. 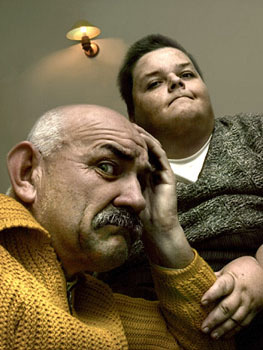 This is a photographer whose sensibility gives even her commercial images a hardness that's unusual in client work. I've seen the work of some emerging photographers attempt to take on this type of hardness, but the resulting work, whether personal or for clients, ends up feeling like a copped attitude. Lee's work will definitely turn some people off (both in choice of subjects and style), but it has the feel of a real personal and uncompromised vision, not a riding of the winds of commercial and gallery fashion. ("The Youngest Parents" and "Children's Games", along with several of the portraits, are my favorites on her website). 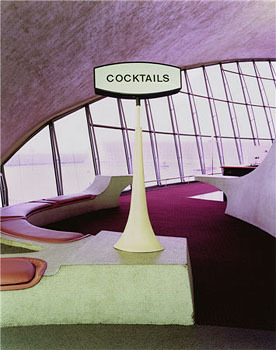 "Eggleston certainly had some influence on the current generation as a poetic formalist, but Lewis keeps emphasizing the (apparently) casual, snapshot side of his work--“garish” color, “bad” lighting, “banal” subject matter. I put all these terms in quotes because Eggleston isn’t really that casual. When I think of him the images that pop into my head are his tributes to "found color"--painted stripes on walls, product displays in Southern grocery stores, and that outrageous red ceiling (above)--revealing the exacting eye of a color field painter". I'll be off on summer vacation and won't be near a computer for 7 to 10 days. Enjoy the other worthwhile photoblogs and notable sites in the meantime, and though I suppose I should be sharing a more lighthearted, summery link as a send off, the work of 25 year old photojournalist Joseph Sywenkyj just happened to get me on the way out...haunting, artful photographic meditations addressing the ravages of Chernobyl and the many impacts on his homeland of Ukraine. 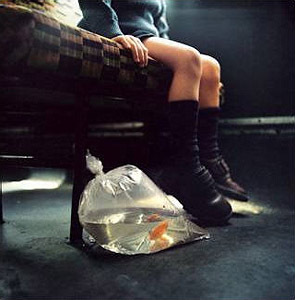 It's no small feat for someone so young to use the tools of photography (in particular, a beautifully subdued, moody color palette), as well as a subtle sense of storytelling, and an incredible empathy, to get us to look at and absorb such difficult subject matter. 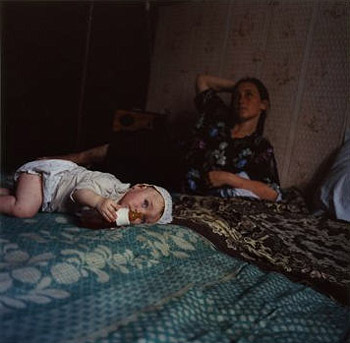 Sywenkyj's website is the best place to go for a comprehensive look at his many projects, but there's a well put together photoessay, The Forgotten Ukrainians, that can be seen at the Digital Journalist site as well. A skim through most of the specialized contemporary art and photography magazines makes it clear that Wang Qingsong, a Chinese painter and photographer, is gaining increasing buzz. 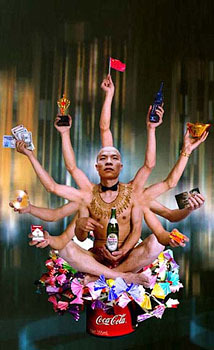 Though he's not in danger of becoming a household name any time soon, it's easy to see why he appeals to the contemporary art crowd and conceptual photography enthusiasts -- he favors large, elaborate tableaux, has a very strong, almost unreal sense of color, and (at his best) makes witty references to the impact of globalization and modernization in China, as well as (more recently) making references to classic painters and artworks in some of his work. His recent large panoramas, which are gaining him increasing attention, tend to suffer heavily when viewed online, as one might expect from such oversized photographic works stuffed with detail, historic references, and in-jokes. Nevertheless, his substantial web site is worth a visit, and there are both HTML and Flash versions (though the images loaded very slowly in my visits there). A number of the earlier non-panoramic images look pretty good, and he has most of his major work dating back to the mid 1990s on the site, as well as links to reviews and articles. Though Qingsong's website is comprehensive, there are other online galleries that are worth visiting that do more justice to some of the key panoramas and don't compress the images as much. In particular, the New Chinese Art website has larger images, and one can enjoy his "Gaudy Life" panorama in clearer detail than on Qingsong's own website (though interestingly, the same image goes by a different name, "The Night Revels of Lao Li"). A fair amount of Qingsong's earlier work (especially pre-2000) strikes me as more didactic and somewhat less interesting than the more recent panoramas, which possess a more subtle sense of humor and more sophisticated sense of staging. (Example: "Look Up! Look Up! ", which seems like a typical riff on Coke as a symbol of nefarious globalization). Still, even when the thrust of his work seems obvious, there's much that's visually pleasing in his panoramas and other staged photos, and he discusses his work very intelligently. If you get a chance to see Qingsong's work published well in an art magazine or specialized photography magazine like Blind Spot or Next Level, it's worth seeing...the color and detail, even in a modestly sized reproduction, is extremely vivid. Online, the color is more washed out, though the images are still enjoyable. Two recommended panoramas from 2003 to look at: "China Mansion", which could use more detail, but has an interesting accompanying discussion, and "Follow Me" (no discussion, but a witty image with excellent detail). Worthwhile articles discussing Qingsong and the Chinese contemporary art and photography scene can be read at the website: three interesting ones come from the NY Times, from ArtKrush, and a more extensive discussion from Chinese contemporary art critic Li Xianting. Also recommended is this short interview with Qingsong about his recent work. Photograms are the simplest of creations, and for the longest time, I didn't see anything special in many of them...I just considered them a very specialized subset of photography. More recently, I've been fascinated by some of the imaginative work done with photograms of various types. 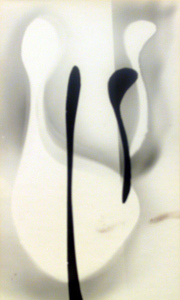 As it turns out, there's an excellent website devoted to the art of the photogram. "The photogram's development process is extremely simple. One can easily create his own photogram by placing an object on a photo-sensitive surface, photo paper for example, inside a dark room. The paper is then briefly exposed to light and developed later. The picture created by this procedure is called a photogram. It seems to be a type of photography; however, it does not necessitate the use of a camera or another optical apparatus. The resulting pictures vary immensely according to the method applied. Sometimes they contain certain objects that remain recognizable. But, the results can also be of a very restrained nature, allowing our imagination to create objects that no longer have anything in common". 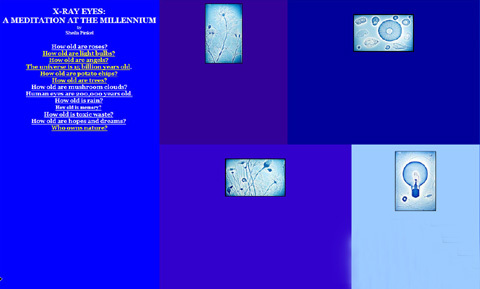 "The images in this site are xeroradiographs produced at the Xerox Medical Research Center in Pasadena from 1978-1985. The commercial name for this technology is mammography and is used to detect cancerous breast tissue. I was greatly affected by the work of Anna Atkins who used cyanotype during the mid-19th century to better understand the structure of the natural world. As I continued doing this work I fell in love with the beauty and complexity of the structures revealed and their potential to symbolize broader cultural meaning". * Anne Barnard's website features an assortment of photograms, some quite literal, others considerably more abstract. The human body and various body parts are very familiar subjects for photograms, but the manipulations Barnard performs on the images produces some provocative work...the resulting distortions and disfigurations remind me of images from a David Cronenberg film at times. My favorite of her various portfolios are her iris prints from silver toned photographs. 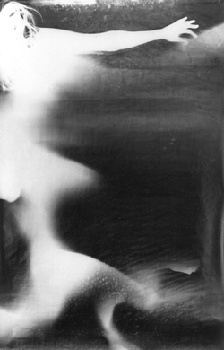 * A fine German site featuring photograms of the human body in poetic states of motion and distortion. * An interesting and thought-provoking essay on seminal Pop Art painter and collagist Robert Rauschenberg's experiments with photograms and alternative processes. This was one of my favorite finds from the photogram website, as it thoughtfully discusses the photographic foundations of hybrid artworks, and provides some background on Rauschenberg's fascination with photography, as well as showing him at work. 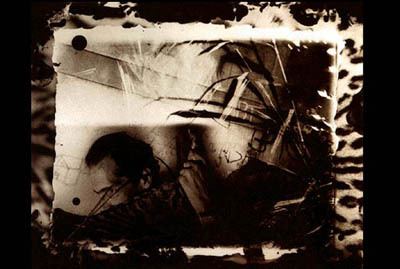 (One of his more interesting photogram based collages, Booster, can be seen here). * Finally, another interesting discussion on the creative deployment of photograms: filmmaker Stefan Themerson's "Trick Table" for making photograms. 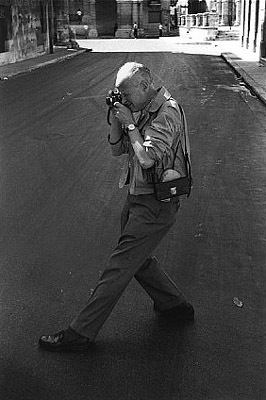 "Frenchman Henri Cartier-Bresson, widely regarded as one of the great photographers of the 20th century, has died aged 95, LCI television reported on Wednesday." There will no doubt be a flurry of thoughtful obituaries appearing over the next few days. I can't imagine most visitors here don't already have some sort of book or reference with photographs from the great photographer...I have a small French anthology I used to look at constantly for inspiration. But here are a couple of links to extensive image banks of his work, from the Peter Fetterman Gallery (a generous collection, including some lesser known images I don't even remember seeing) and from a 2000 exhibition of his underrated portraits at the National Portrait Gallery. And of course, over a hundred essential images from his book, The Decisive Moment, published in 1952. * 1998 Guardian Profile, "A Life in Pictures"